This week, the US and the EU will resume negotiations on investment protection in TTIP. The European Commission – claiming to have listened to public opinion – produced its proposal for a ‘new’ Investment Court System (ICS) that would allegedly replace the ‘old’ ISDS in all on-going and future investment negotiations. However, we believe that the proposed changes are just a ‘re-branding’ of the old ISDS system. The EU has not addressed the key problems of the ISDS and ICS systems both of which undermine democratic decision-making. The number of investor-state cases has recently sharply increased, with over 50 new claims filed annually in the last four years. The total number of known ISDS cases has now risen to 667 claims against a total of 105 countries in a diverse array of government policies, many of which are not traditional trade issues. One example is the shocking case of Canadian pipeline developer TransCanada who is seeking to sue the US government for blocking the Keystone XL Pipeline as part of its fight against climate change. It is noteworthy that TransCanada is suing the US using four investor rights in the North American Free Trade Agreement (NAFTA) that are also included in CETA and the EU’s ICS proposal. In addition, the key changes advocated by the Commission as improvements to the system in its recent proposal are riddled with legal shortcomings in two key areas: the alleged independence of the system and the alleged protection of the right to regulate. While the introduction of so-called ‘judges’ to investment tribunals appears to be a positive step, they will be paid lucrative fees on a case by case basis providing a strong incentive to rule in favour of the investors in order to ensure future cases. This investor bias would most likely remain if the EU and its trading partners eventually introduced a regular salary for the ‘judges’ because in legal systems where only one side can sue, claimant-friendly rulings secure a steady flow of cases, power and authority for the adjudicators. The right to regulate in the public interest does not protect against unlimited backward looking damages including expected profits and interests. It is furthermore undermined by the need for governments to take the ‘measures necessary’ to achieve ‘legitimate’ objectives leaving the criteria to define what measures are necessary and what constitutes legitimate objectives open for interpretation, and ultimately, arbitration by for-profit adjudicators. An ISDS case may not prevent legislation, but it puts a hefty price tag on any law or regulation which could potentially cost billions in taxpayer money when a government is later sued for compensation. This has already proven to create a regulatory chill such as has been witnessed in Malaysia and New Zealand who were waiting for the outcome of the Phillip Morris ISDS case against Australia before implementing similar plain packaging legislation. The EU’s claim that it has protected the ‘right to regulate’ gives a false impression of security; health, environmental and social legislation remain under threat in the EU, the US and Canada if ISDS/ICS is included in CETA and the TTIP. While existing trade and investment treaties already severely limit the policy space that governments have, the inclusion of ISDS/ICS in CETA and TTIP would massively expand the investment arbitration system – and multiply liability and financial risks for governments on both sides of the Atlantic. ISDS in TTIP would newly empower more than 47,000 of the 51,495 US owned subsidiaries currently operating in the EU to launch ISDS attacks on European policies and government actions. Even if TTIP did not include the far-reaching investor rights, four out of five US firms operating in the EU–that is a total of 41,811–could already become eligible for an ISDS case against the EU and its members using the CETA agreement if investments are structured accordingly. The danger of being sued under TTIP and CETA is even more real given that US, European and Canadian companies are already the most frequent users of investment arbitration. They are responsible for launching over 80 per cent of all known investor-state disputes globally. Indeed, UNCTAD’s recently updated online data shows that foreign investors launched more ISDS cases in 2015 than in any prior year — twice the number launched just five years earlier. 52% of concluded ISDS cases have ended in an outright loss for the government or a settlement with the foreign investor. 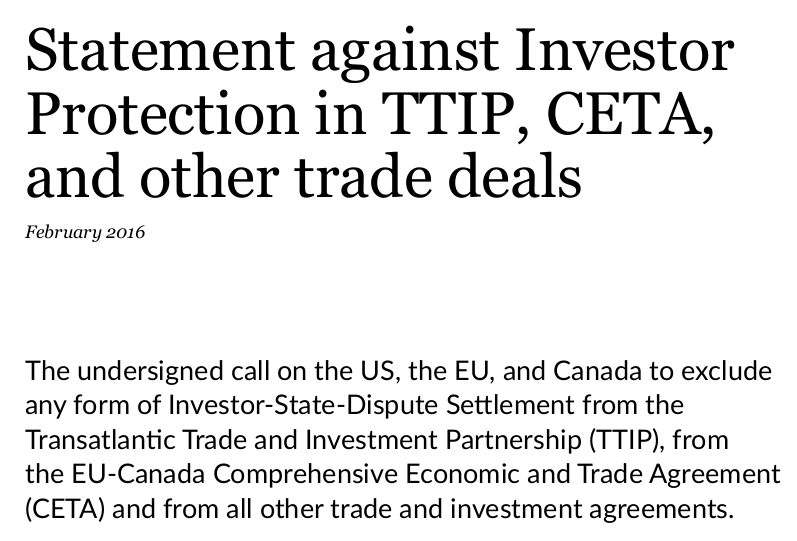 Not only would the inclusion of ISDS/ICS in CETA and TTIP most likely lead to a massive explosion of investment arbitration cases against legitimate policies; their inclusion is a massive blow to democracy, human rights and the rule of law in any trade and investment agreement. In a time when all attention should be focused on averting a global climate catastrophe and on tackling the economic and social crises in many parts of the world, there is no space for agreements that would place giant obstacles in the way of the solutions. Governments must have the flexibility to put in place measures to protect their people and the planet without fear of expensive trade litigation being launched by corporations. If there is concern about weaknesses in domestic legal systems, we should be focusing on improving them in order to combine equal access to the law with a full capacity for the democratic scrutiny of the development of law. 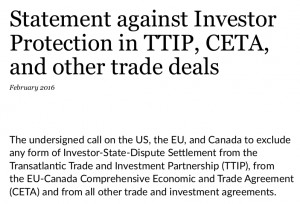 We therefore cannot support the foreign investor protection proposed for TTIP and CETA, and call, again, for the exclusion of any form of Investor-State-Dispute Settlement from all current and future trade and investment agreements.